“Heritage” was CreativeMornings’ global theme in July, 2014. It was fitting that Chicago’s chapter centered attention on sign painter Ches Perry, and his son, Alex Perry, from Right Way Signs, to speak. For the first time, the format of this talk was done as a live interview, conducted by Kim Knoll, the organizer of CreativeMornings/Chicago. Ches is a traditional sign painter. Demands of this discipline include applying ink to a vertical surface—one controlled stroke at a time—with graceful ease and delicate patience. The results are characters of letters, letters with character. 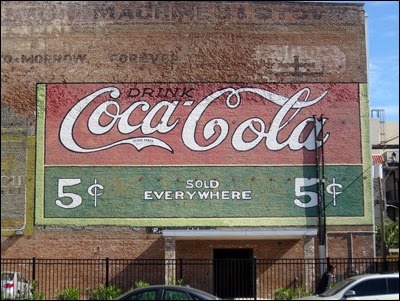 The rise of sign painting accompanied the birth of towns and cities. It blossomed with the presence of buildings and the prominence of commerce. 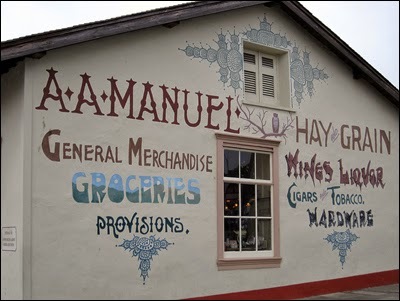 This tradition of sign painting was an inheritance—the first type of heritage I sensed—adopted by Ches as his occupation. In turn, his son became inspired—perhaps, imprinted, a second type of heritage—to join his father in the sign-making business, and adapting its relevance in a world of digital communication, that is, “digital exhaustion” according to Alex, based on reactions from his and father’s clients. The rise of plotters, from the 1970s onward, and vector graphics in the 1980s, encroached on the appeal of hand-lettered and painted signs. Computing technology brought speed and standardization—unlike sign painting, which requires time and defies uniformity. Plotters coldly automating letters, as Ches put it, “is a drag.” A composition of machine-driven letterforms is an assembly, whereas a composition of human-driven letterforms is a medley. Throughout the interview, Ches exhibited a quiet demeanor, particularly during his live demonstration of hand-painting a custom sign. A smooth-and-connected performance, up-close and personal between brush and board. Every inked brushstroke was applied without hesitation, with quiet confidence, matched by a spirited quietude of attention by the audience. I was grateful to witness Ches’ soft-spoken reservation, indicative of a humble practitioner, flowing into a graceful display of craft under calm. Alex described his father bluntly: “He just wants to paint the sign.” Clearly, Ches was the aesthetic arm (in more ways than one) of Right Way Signs. He reinforced the pattern of a person who is primarily and visibly concerned with a particular portfolio of techniques and tools. In Ches’ case, his professional cache bear-hugs sign painting. Accompanying the skills of sign painting are its stories. As examples of Ches’ work digitally projected as a backdrop to his and Alex’s interview, they shared anecdotes of vertigo while making signs hundreds of feet above the ground (at the same time operating mechanical ladders), deft improv of correcting spelling mistakes (recognized midway or afterwards), mutant-like optical judgments in drawing letterforms elegantly executed on an extra-extra-wide rooftop (that can clearly satisfy aerial views of the sign), including the aromatherapy from chemicals of primer and pigment characterizing a sign-painting studio. The interview served up a streaming narrative of sign-painting-lore. The timing of this talk was also a personal delight, prompting me to reminisce about typography discovered and photographed during my trips across America. 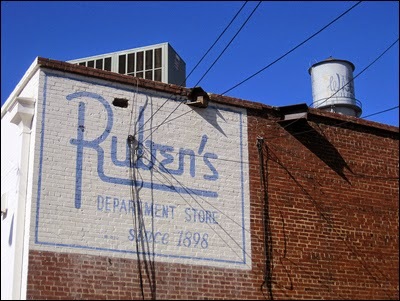 A major portion of this documentation is focused on hand-painted signs, including “ghost signs” (that have deteriorated over time). Ches’ works keep relevant the long marked timeline of hand-painted signage and bolsters the memory of our information landscape from era to era. It’s a memory composed, literally and historically, of signs of the times. 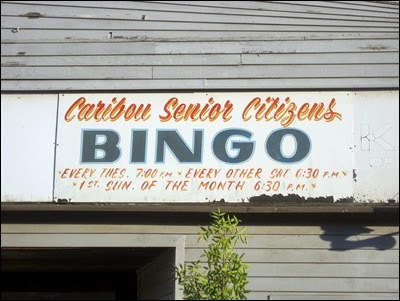 These kinds of signs also stir memory at an emotional level, for after noticing one while on the road or during a stroll, and recognizing its handmade texture and working-class vibe, it warms you up from the inside. Considering this talk’s online registration filled to capacity in less than a minute, and that 145 attendees (exceeding capacity) were captivated, it proves again that the handmade (signage and beyond) is inspiring, even in the modern climate. Ches Perry gave a refreshing look inside his tactile craft, fully endowed with the human touch. This was the third type of heritage I sensed, one that is wide-reaching with the potential of uplifting sensibilities… a cultural heritage. Big thanks: to Grind—for hosting—and Basecamp for sponsoring Chicago CreativeMornings #32; to organizer Kim Knoll and operations manager Kyle Eertmoed of Knoed Creative, who spoke at Chicago CreativeMornings #7, and to the Chicago CreativeMornings crew—Joy Burke, Pedro Carmo, Rusty C. Cook, Benjamin Derico, Erick De La Rosa, Steve Delahoyde, Chris Gallevo, Neftali Morales, Jeremy Mumenthaler, Isaac Steiner, Martha Willis—for their volunteer work in making CreativeMornings happen in Chicago. 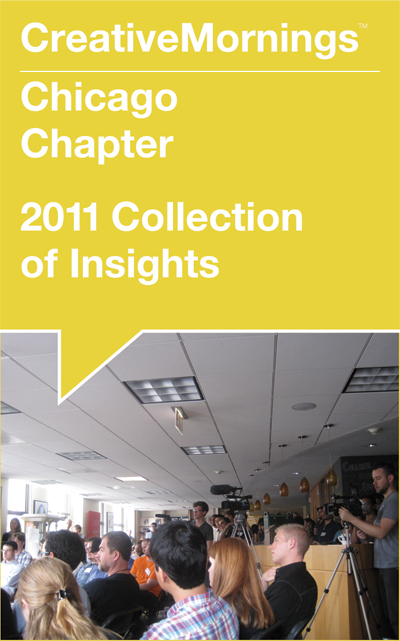 Read more about the people who make the Chicago chapter of CreativeMornings possible. 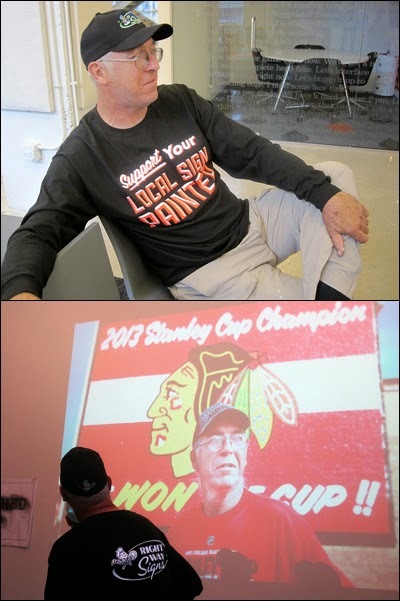 See step-by-step photos of Ches Perry’s live demonstration of sign painting at 32nd gathering of CreativeMornings’ Chicago chapter. Read my interview with Faythe Levine and Sam Macon, who are the filmmakers of documentary “Sign Painters” about the American tradition of hand-painted signs. My coverage: view more photos of 32nd CreativeMornings in Chicago; read more write-ups about Chicago CreativeMornings.